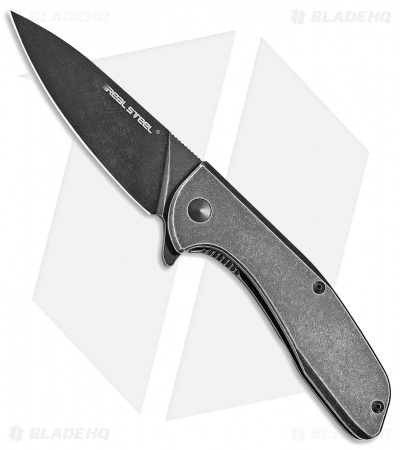 The E571 folding knife from Real Steel knives is the first full-steel frame lock knife the company has produced. It has a blade made from Sandvik 14C28N steel and a stainless steel handle made from 3Cr13 steel. These strong stainless steels make the E571 an extremely durable knife without adding too much extra weight. A ball bearing pivot allows for super smooth opening when using the blade flipper. The frame lock allows for a slim profile that makes for a very comfortable everyday carry knife. It comes equipped with a Beta-Plus safety that adds an extra level of operational safety on the frame lock mechanism. Includes a deep carry pocket clip for tip-up carry. This E571 model has a black coated blade and a stonewashed handle.